The new Fellowes AutoMax 350C Cross-Cut Shredder features revolutionary AccuFeed Technology. Simply load up to 350 sheets into the drawer and the Automax 350C will shred 10 sheets at a time, unlike traditional auto-feed shredders that only shred one sheet at a time, making AutoMax shredders up to 10 times faster. The AutoMax range of shredders are the World's first truly hands free walk-away auto-feed machines. They are also the most accurate autofeed shredders on the market, meaning you can have confidence that your confidential information will be destroyed. The Fellowes AutoMax 350C shredders have been specially designed to overcome the limitations with traditional auto-feed machines and can handle a variety of different paper types and sizes. This includes crumpled sheets, small sheets, glossy paper and non folded legal paper. There is also a manual feed system to destroy Credit Cards, CDs/DVDs/Blu-Rays, folded paper and junk mail. There is no need to prepare the paper into pre-stacked, perfectly aligned piles for the AutoMax 350C, there is even no need to remove staples or paper clips*; simply load up to 350 sheets into the shredding drawer, close, press shred and walk away. Your documents will be shredded into tiny 4x38mm Security Level P-4 particles in 12 minutes or less (depending on the number of sheets entered). Waste shreds fall into the generous 68 litre waste bin that features a mechanism to evenly distribute shredded paper to avoid false bin full interruptions. A Jam Prevention system automatically stops and reverses paper if a jam occurs, preventing shredding interruptions whilst SilentShred enhances usage in any quiet office. 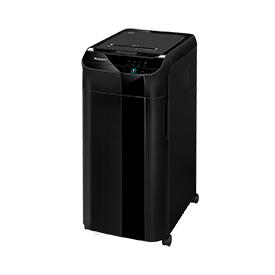 A sleep mode feature shuts down the shredder after 2 minutes of inactivity for great Energy Savings. The AutoMax 350C also comes equipped with the SmartLock safety feature which is an optional 4-digit locking system that keeps documents secure during the shredding cycle. The innovative LED touch screen allows ease of use for any user and the convenient, front-loading pull out drawer allows you to shred a few, or even hundreds of documents per cycle. *Machine will not shred industrial staples or paper stapled in the top centre. More than 20 pages stapled or paper clipped together should be pulled apart.